Multi-purpose gym, massage hut, media room etc. A boutique hotel located adjacent to the famous Unawatuna beach in Sri Lanka, Sergeant House is a sprawling property comprising several rooms and pavilions that are perfect for large gatherings, for which you can rent out the entire place. If you wish, you can opt to book a few rooms as well. An infinity pool spilling onto the lower pavilion and lily ponds, rests majestically overlooking lush vegetation. Considering Sri Lanka’s vast colonial history, the architecture hints at the past with its colonnade, high-soaring ceiling, beige-black interiors, and a rustic ambiance. At Sergeant House, you have the option to booking the whole place or number of rooms, as per choice. 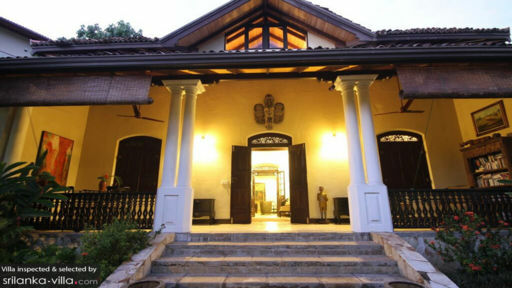 The bungalow comprises of three bedrooms, besides which there is the Poolside Pavilion, Long View Pavilion, and the Cave. With six bedrooms, the place is big enough for a large gathering. The Sergeant’s bungalows with four beds, can be rented as a complete unit as it affords privacy to guests. The main bedroom is furnished with a king-sized bed, the other two bedrooms are furnished with a queen-sized bed, and two four-poster beds. The poolside pavilion is furnished with king-sized bed with mosquito net, writing desk, tea service, fridge, air-conditioner etc. The Long View Pavilion is a luxurious space located above the Ambalama offering excellent views of the property. It has a bedroom with a king-sized bed as well as a living area. With a kitchenette, this is a great suite for families or those looking for privacy. The Cave is found nestled in a cozy cottage with twin, canopied, single beds. It is equipped with all amenities for a self-sustained house. Each bedroom has its own en-suite bathroom. As soon as you step through the antique wooden doors of Sergeant House, you will be enchanted by the abundance of natural foliage in front of you. There are lily ponds, exotic flowers, trees, plants, and bushes of all varieties staying to true to the tropics. The relaxing vibe runs through to the infinity pool which overlooks the greenery of Sri Lanka, and as you laze on the double lounge sofa that seemingly floats on the pool, you will feel utterly well-rested. There are sun chairs as well beside the pool for sunbathing. Head to the spa pool besides the lily ponds and play around with the many jets and settings to release all the tension in your muscles. For living areas, Sergeant House features a traditional Ambalama or a ‘rest pavilion’, which is an open-sided living area ideal for lounging with friends and family. With antique furniture, high-soaring ceiling, exposed wooden beams, and a gorgeous view of the pool and gardens, the ambalama is the best place for mingling with loved ones. There are comfortable lounge chairs, sofas, and chairs as well as décor including fresh flowers, glass bell chandeliers and an all around homely ambiance. The Ambalama comprises a banquet dining table so that all the guests of the villa can accommodate themselves comfortably and enjoy a hearty meal together. The table can be separated to form smaller dining areas, as per preference. The gourmet kitchen at Sergeant House prides itself in offering cooking classes to guests, to learn more about Sri Lankan cuisine. 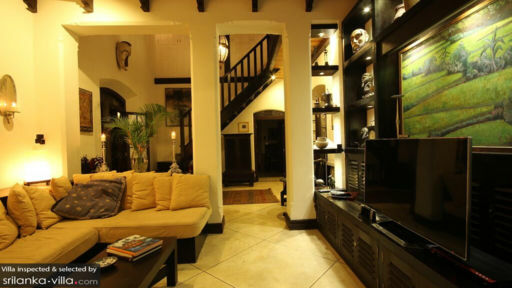 It is fully-equipped with modern appliances and facilities. A chill-out and games room which is found adjacent to the pool, is partially outdoors and is perfect for hanging out as it has board games, darts, carom. There are books and children’s toys as well for guests to enjoy. There are numerous services being offered at Sergeant House including a massage hut, where guests can indulge in massage therapies etc. and a multi-purpose gym. The staff is experienced and generous to the guests’ needs. 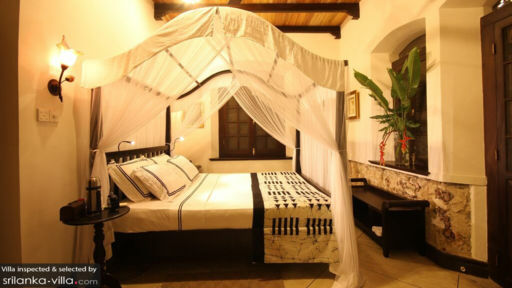 The boutique hotel is found near the famous and historical Galle Fort, a UNESCO World Heritage Site. Unawatuna beach is across the road from where you are, for easy access. There are numerous cafes, restaurants, and bars for you to explore.